As another school term starts, many parents may be looking for inspiration and wondering what should they be packing into their child or teens lunch box? It's an age-old question, which needs to strike the fine balance between foods which will help to keep them powering through the day but also ones that you know will get eaten. It can be tough as a parent when you're often having to juggle so many different balls in the air. The last thing you want to feel is 'judged' when you have gone to all the effort to prepare a lunchbox for your child or teen. First and foremost, the fact that you have lovingly done the best that you can reigns supreme! However, if you're struggling for ideas, here are some tips to help you win the battle of the school lunchbox. You don't know until you ask. Often it can start as simply as, asking your child what foods they liked/disliked in their lunch boxes last term. Were there any foods which were continually being returned? Why did your children dislike them? It may have been as simple as not liking sammies made soggy from tomato, the food being 'stinky' or that the empty yoghurt pottle messes up their bag. Once you know what the issue is, you can then set about working through a solution. Shop and plan for lunchbox items together. Children and teenagers are more likely to eat foods that they have been involved in the planning of. Plan a trip to the supermarket with your child/teen or involve them in the online shopping process. Start by making a list of the things you need to buy. Be sure to include foods for lunches and snacks. When at the supermarket ask your child/teen to select one new food they would like to try that week. Where possible, try to encourage them to select whole foods, rather than those which fall into the treat food category. If the thought of taking your child (or children!) to the supermarket is enough to give you anxiety, you can still involve them in the planning process while you're in the 'safety' of home. Try the new foods out at home first. There is no point sending your child/teen off to school with a 'new food hidden in their lunch box if they don't know how to eat it or what to do with it. Chances are it will come back home again or even worse, be thrown into a rubbish bin! At home, you can freshly prepare the new food and show your child or teen how it should be eaten. Remember it can sometimes take up to 15 tries of an unfamiliar food before it is accepted. Perseverance is key! Get involved. Kids like to get their hands dirty and be involved, and the same goes when it comes to food preparation. Involve your child by encouraging them to help you boil or mash eggs, cut cucumber or fruit, make mini pizzas and so on. The chances are your child/teen will be more likely to eat something they have had a hand in making. The same goes for your evening meals! Have you got enough? Always make sure you pack enough food in the lunchbox for at least one-two snacks and lunch. If your child/teen is going to school early, they may need something additional for breakfast or if they are staying late or they will be heading off to after-school activities, they may need to also pack another snack. Remember their age. Feeding teens is different from feeding younger children. It's important that you understand and listen to your teen when planning your family meals and snacks. Give your teen a certain amount of control with what they eat. Keep it chilled. Meat, chicken, fish, milk, cheese, yoghurt, hard-boiled eggs or any foods that are high in protein, need to be kept cold, especially during the summer months, to reduce the risk of food-borne illness. Pack these items in an insulated lunch box, or use a pre-frozen drink bottle or ice-pack. This can also help to minimise the 'stink factor'. Keep hydrated. Always make sure you include a drink in your child/teen's lunch box. Water is best. Over the warmer months, it may pay to freeze the drink bottles overnight, so they remain chilled during the day. They can also help to keep the contents of the lunchbox cool. What should I put in a lunchbox? Outlined below is a guide to follow when you are packing a healthy lunchbox. Remember this is a guide only, because let's be honest, some days you might be scrapping together whatever you can find, and that is ok too! Plenty of non-starchy vegetables and fruit. This can be a mixture of fresh, frozen and cooked. 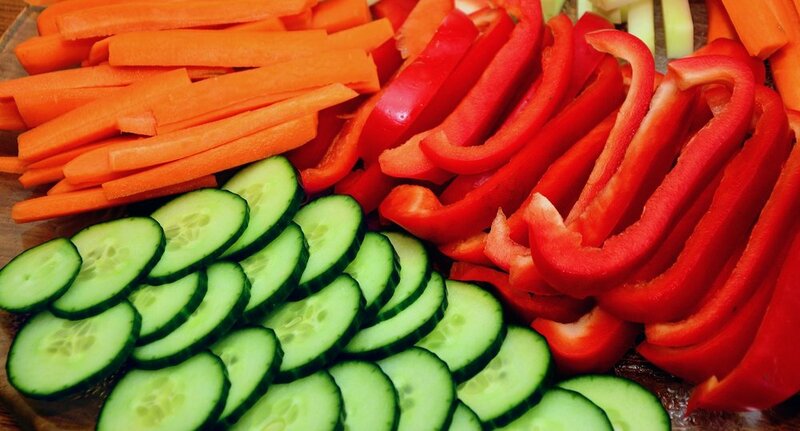 Cut into manageable pieces for smaller hands to hold and for added variety, such as preparing cucumber slices, or carrot sticks. For the more creative, you could try using a cookie cutter to cut the fruit or vegetables out into to different shapes eg stars, dinosaurs or unicorns. Try to select vegetables and fruit from a rainbow of different colours. Each colour provides a different range array of nutrients. Some grain foods (preferably whole grain), or starchy vegetables such as bread, wraps, quinoa, brown rice, oats, corn thins, pasta, kumara, potato or corn. Foods from this group provide children with fuel and fibre. Some legumes (tofu, soybeans, chickpeas, kidney beans, lentils, hummus etc), fish, seafood, eggs, poultry or lean meat. These foods provide children and teens with protein which helps support their growth and development. Oily fish, such as salmon, sardine and tuna, also provides healthy omega-3 fatty acids to support brain development. Some milk, yoghurt, cheese or alternatives. The foods in this group provide protein and calcium which children and teens need to build strong bones. Lunchbox examples include cheese slices or cubes, plain milk in a long-life tetra or used in a homemade smoothie and a pottle of yoghurt. Some healthy fats, nuts and seeds. Think avocado, nuts, nut butters, seeds, nut and seed mixes or olive oil-based dressings added to a salad, when you think of this group. However, depending on your school's nut policy, you may not be able to include nuts or nut-products into your child's lunch box. In these instances, seeds can be a good alternative. Sandwiches, wraps, pita pockets or rolls using wholegrain bread filled with salad, legumes, chicken, fish, egg, lean meat or cheese. Remember to keep these cold, especially during summer. Homemade smoothie - this can discolour and separate as the day goes on, so encourage your child to have this first and remember to keep it chilled. Not sure what sized portion to serve your child or teen?